After plans to add a stop in Selah on the Yakima-Ellensburg Commuter fell through, Yakima Transit is instead modifying Route 10 to extend service to Firing Center P&R. Effective today, 3/24/14, the service change brings several changes to Route 10. On outbound service, the bus will still enter Selah using the same route on Selah Road (Hwy 823). At Jim Clement Way, the bus will turn right and continue heading northbound to Park Drive, where it will turn right again and serve the North Park Centre area. Following Park Drive northbound, the bus will turn left at Goodlander Road. At Wenas Road (Hwy 823), the bus will turn right and again continue heading northbound, veering east at the intersection of Harrison Road. At the corner of Hwy 821, the bus will turn right and cross over Interstate 82 to serve the stop at Firing Center P&R (in front of the gas station), where it will then turn around and follow the same route back into Selah. 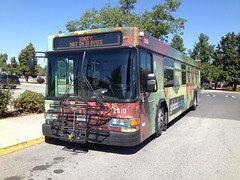 Back in Selah, the bus will head westbound on Goodlander Road, and then turn left to head south on 1st Street. At Fremont Ave, the bus will turn left and serve the stop at Wenas Road and Fremont Ave (next to Selah Christian Church, where the city paid to pave the parking lot for use as a Park and Ride). 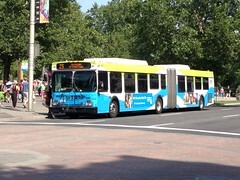 At Naches Ave, the bus will turn right and head eastbound, then north on 1st Street, and then left again to head westbound on Fremont Ave. After serving the current loop on Speyers Road, 11th Street, and Fremont Ave, the bus will finally head southbound on 1st Street and head back to Yakima. Note that while the route is extended north to the Firing Center P&R, only 7 trips will serve the stop daily. 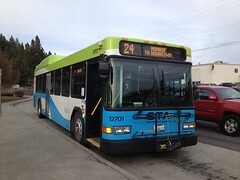 With the exception of the 7:15AM and the 6:15PM trips from Yakima Transit Center, all other trips will only go up Harrison Road to Zirkle Fruit before turning back southbound. On the Saturday and Sunday schedules, all trips except the last ones of the day (6:15PM Saturday and 3:45PM Sunday) will only go as far as the Zirkle Fruit stop. Obviously a large part of this route extension is to improve access to the Yakima-Ellensburg Commuter for Selah residents. With the long-term status of the YEC still up in the air, it may seem that this route change is a bit short-sited. However, this is something that Selah has been planning to do regardless of the future of the YEC. It’s hard to say if more or less trips would serve the Firing Center P&R if the YEC was discontinued, but of course it’ll be better for all transit passengers in the area if that doesn’t happen. Note that with the service change effective today, there is also a small change to the inbound routing on Route 1. On 72nd Ave, the bus will turn right and head eastbound on Chestnut Ave, then left on 65th Ave to head northbound and serve the stop at Harman Center before turning right and resuming the old route at Summitview Ave.